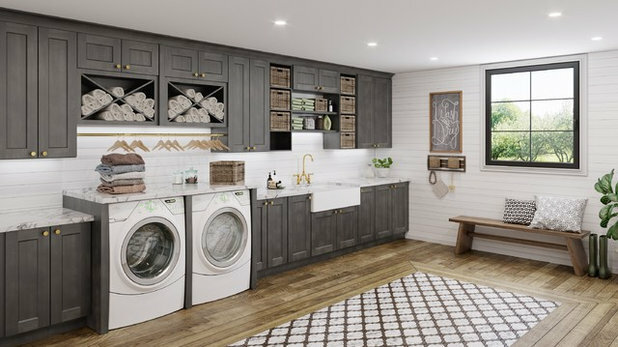 New products and styles for cabinetry and benchtops were on display at the Kitchen & Bath Industry Show (KBIS), one of the industry’s biggest events in the USA, held in Las Vegas in late February. Dark tones for cabinets and benchtops were seen throughout the show, as well as engineered surfaces inspired by natural and industrial materials. 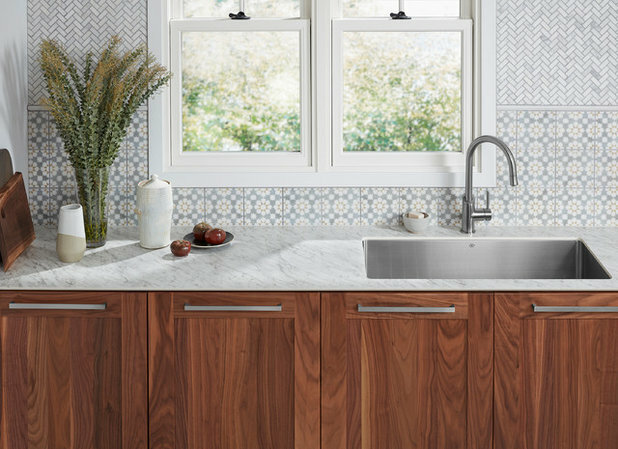 Read on to learn about the new trends Houzz spotted at the trade show for the kitchen and bath industries. 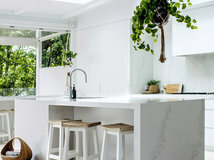 White Shaker cabinets remain the most popular choice for kitchen renovations, with wood and grey respectively in second and third place, according to Houzz data. But a number of vendors are seeing new interest in darker cabinets. 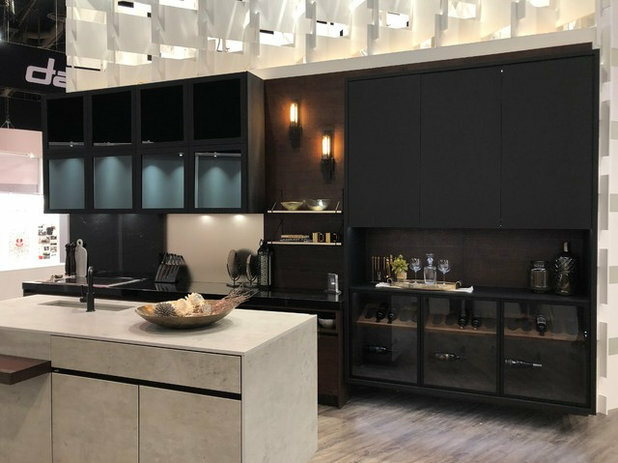 Representatives from Cabico Custom Cabinetry in Canada say many visitors were interested in their matt-black cabinets on display at KBIS (shown in this photo). Cabinetmaker U.S. 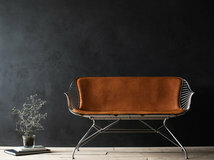 Cabinet Depot debuted a new Cinder colour at the show – a warm brown-grey (shown in this photo) that was popular with visitors to the company’s KBIS booth. When seen in person, the cabinets display a blend of charcoal and brown. 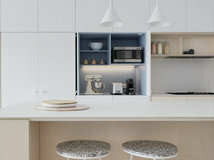 Navy cabinets are also still quite popular, and some benchtop manufacturers are responding by injecting navy and other blues into their benchtop materials (more on this below). 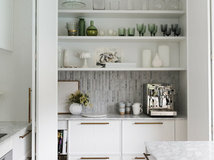 White cabinets aren’t going anywhere, of course, but designer Eleanor Bouchard at the Cabico booth notes that warmer whites are rising in popularity. She also says timber cabinetry with a bleached-out, rustic look is gaining steam. 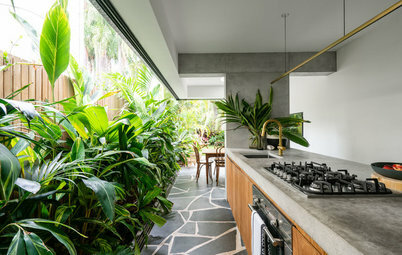 The patterns for engineered-quartz benchtops are continuing to become more interesting and dynamic, and many home renovators are choosing this material for its durability. 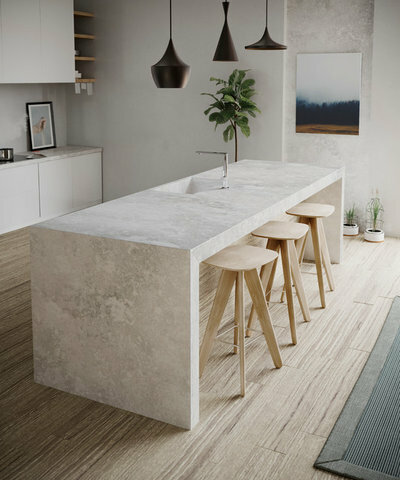 This year in the USA, engineered quartz became more popular than natural stone for upgraded kitchen benchtops in kitchen renovations, according to Houzz research. 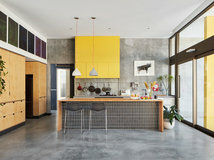 While white remains the most popular colour choice for upgraded benchtops in kitchen revamps, multicoloured benchtops are the second pick, while grey is in third place, Houzz data reveals. 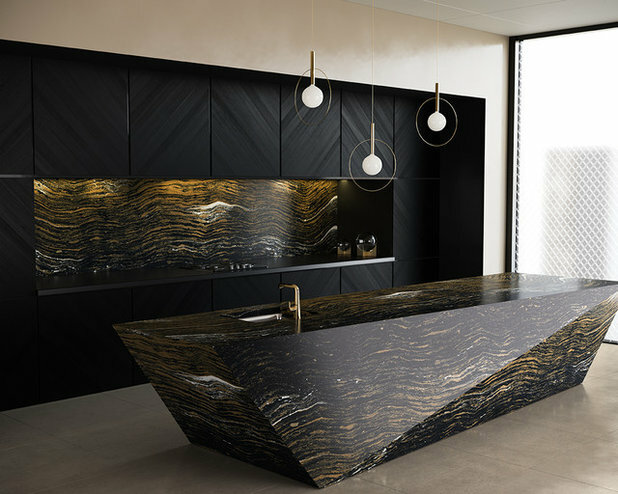 Several companies showed off darker engineered benchtops this year at KBIS. 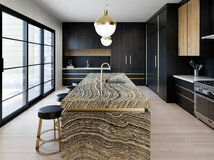 This image shows the new Golden Dragon design from Cambria, an engineered quartz that features a black background with gold veining and white highlights. 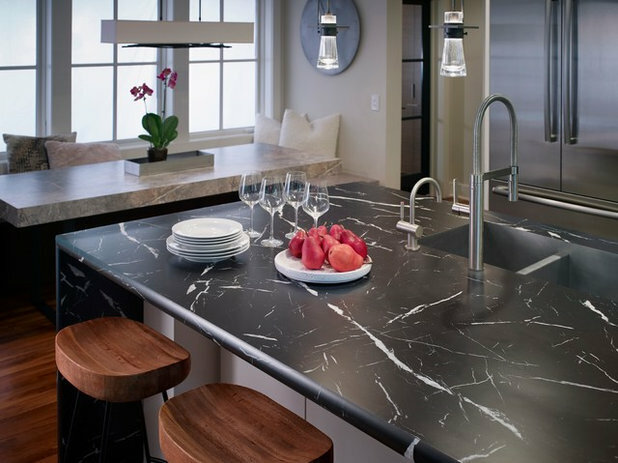 The design is part of the new Black Marble collection that Cambria launched in response to the growing demand for darker benchtop styles. 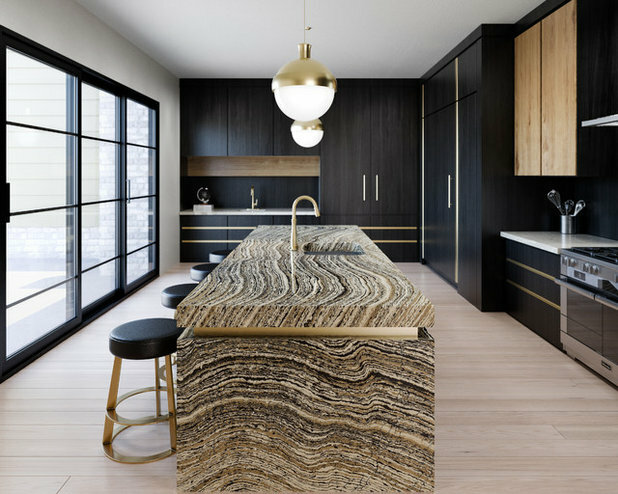 Cosentino introduced Eternal Noir, an engineered quartz in rich black with gold and warm-white veining. 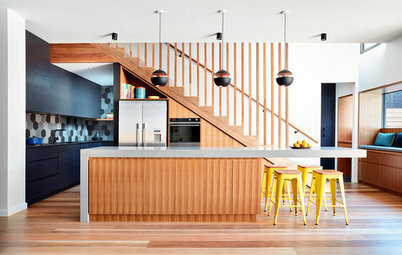 In this photo it’s shown as an island benchtop material – note the dark cabinetry in the background. 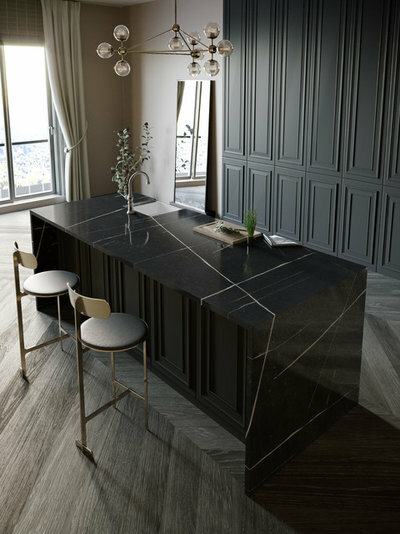 Formica Group also jumped into the dark-benchtop business at this year’s KBIS with its new Nero Marquina laminate, shown in this image. Of all Formica’s new products at the show, this design generated the most interest, says Owen Serey, assistant marketing manager at the company. 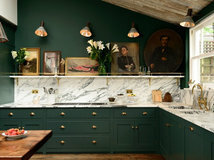 Multiple manufacturers displayed navy or navy-flecked benchtops that marry well with still-trending deep blue cabinets; navy is especially popular as an island-base or lower-cabinetry colour. 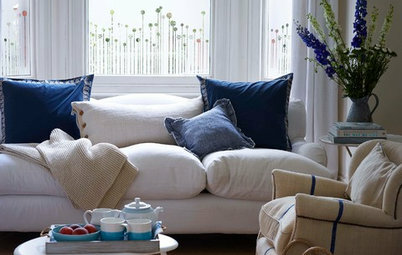 This image shows Cambria’s new Islington design with dramatic navy and blue tones interspersed with greys and whites. 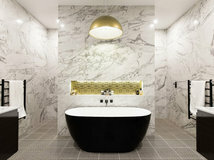 It’s also part of Cambria’s new Black Marble collection. 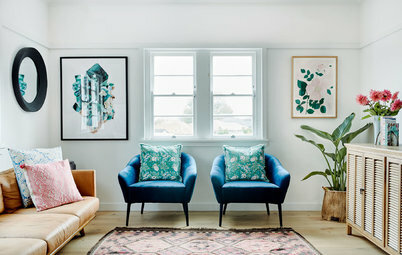 Timber-look patterns have been trending in flooring and wall applications for some time, but it’s new to see them on benchtops in place of authentic timber. Clairidge, shown in this image, is Cambria’s first timber-look design. 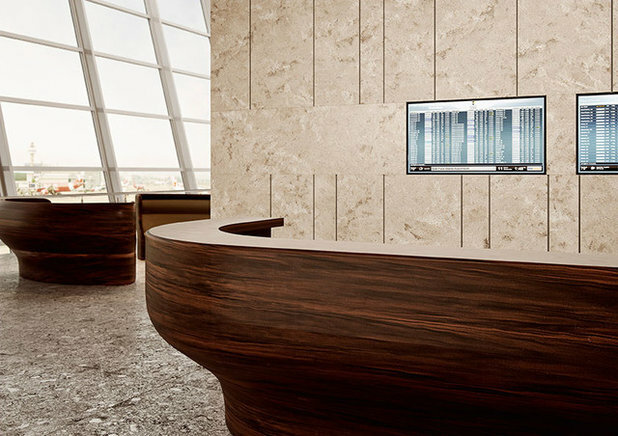 It features tan, walnut brown, cream, black and grey in undulating parallel layers that mimic the appearance of wood grain. 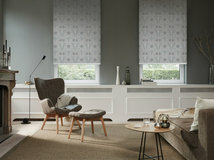 The design is the inaugural offering from the company’s Woodstone collection, which is inspired by the tones and movement of various timber grains. 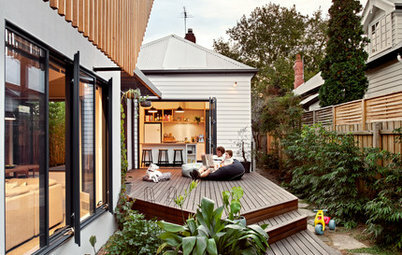 Again, you can’t help but notice the on-trend dark cabinetry in this image. 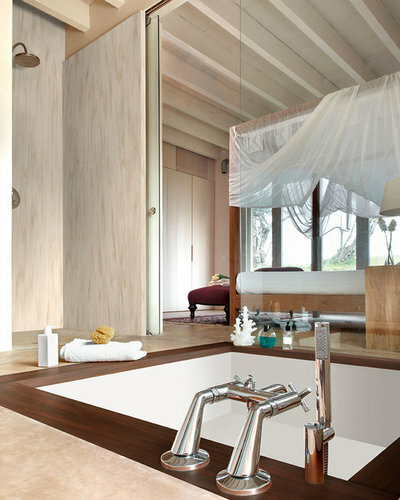 Corian introduced two timber-look designs for its solid-surface products, and this image shows one of them, Mahogany Nuwood. 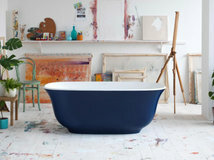 Corian’s flexible solid-surface products can be applied to curves, as shown in this photo. Corian’s second timber-look design that debuted at KBIS this year is the paler Beech Nuwood. Formica also added two new timber-pattern laminates, including a white knotty maple, shown in this photo, and a smoky walnut. 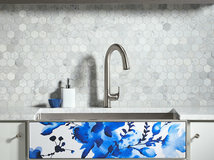 Some benchtop manufacturers debuted new patterns that echo the look of concrete or Cor-Ten steel and work well with industrial-style interior designs. 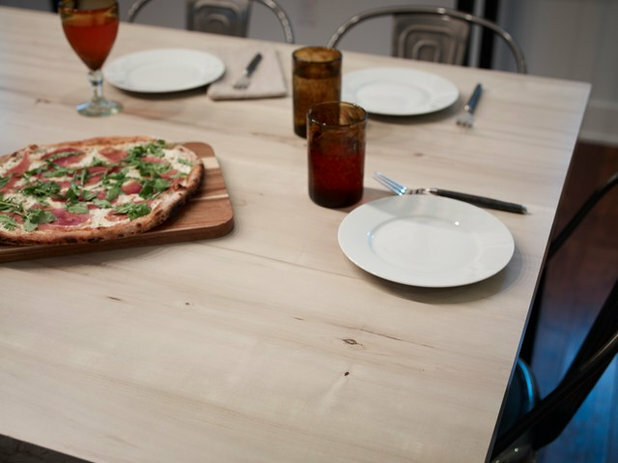 Cosentino’s Loft series for its Silestone product features two new designs named after USA hipster enclaves Brooklyn (in New York City) and Silver Lake (in Los Angeles). 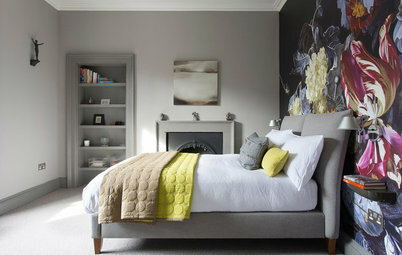 This image shows the new Silver Lake design, which has a white background and a concrete-like pattern in soft grey. Brooklyn has a darker grey cement-like look. 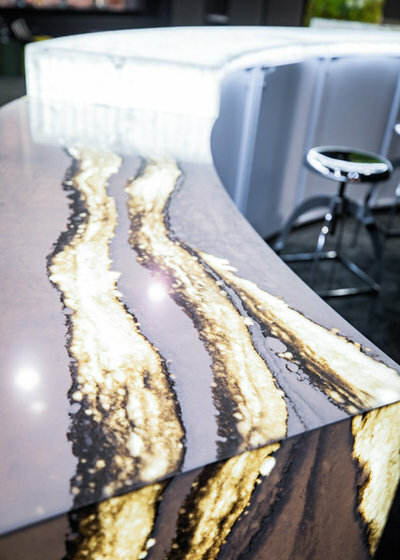 Several of the manufacturers at the show featured backlit engineered surfaces this year. 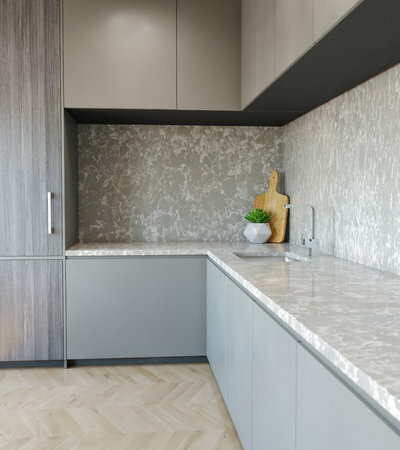 Cambria’s recently launched Myddleton (pictured here) and Baybridge engineered-quartz designs highlight lighter taupes and beiges that create a translucent effect when backlit. 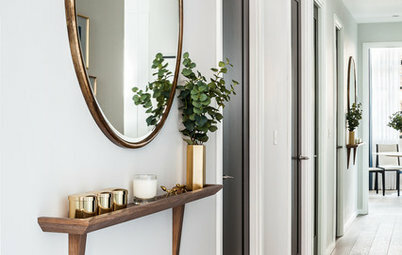 “Consumers are now interested in backlighting kitchen islands, wet bars and even bathroom or closet vanities,” says Eloise Goldman, vice president of public relations at Cambria. Here’s a look at Cambria’s Skara Brae pattern with backlighting, as shown in the company’s KBIS booth. Wilsonart introduced ultrathin benchtops in a range of designs: stone and quartz looks as well as timber-look and steel patterns. 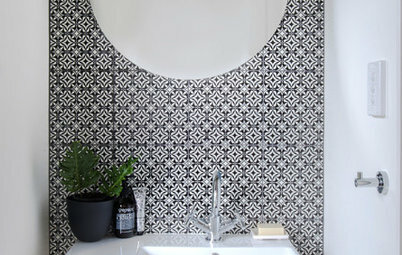 The European-inspired ultrathin surfaces are almost 1.5 centimetres thick and can be installed with an undermounted sink. The material is a new composite made of resins and paper. Cosentino also introduced a thin surface with a 4-millimetre-thick version of its Dekton product, an engineered material made of glass, quartz and porcelain known for outdoor uses due to its durability and resistance to fading. 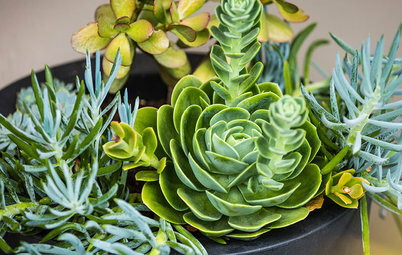 Thanks to its new thinner profile, the product can be used on cabinetry doors and drawers, splashbacks and wall cladding in kitchens and baths, as well as on furniture, and Cosentino is hoping designers will start incorporating the product more indoors. Dekton Slim is available in nine colours. 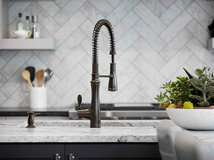 Which of these trends would you welcome into your kitchen? Tell us your favourites in the Comments, like this story, save the images and join the conversation. I love the "potato chip" test, Celestina! I would never have thought of that! Thanks for the great tips, Celestina. The particular solid surface I'm considering is by HiMacs and is a matte finish. The shop gave me a good size piece to take home, so I have tested it under bright lights and no glare! I really appreciate all the info and knowing others don't like the shiny or glaring surface. I don't mind shiny, but the glare that reflects from the bright lights is something that is uncomfortable for me!